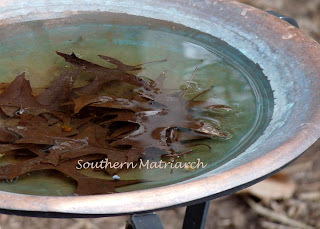 Now this may not show the birdbath in all of its glory. The point here, that is water people!!!! Not the chunk of ice that has been present just way too long. Ahh, it is in the 60's today. It was just in the 30s a few days ago. Blessed relief. Please refer back to this joy of warmer temperatures when I am grumbling about the heat in August. I know that will come just as surely as scripture says "..and night followed day." So enjoy this musical and visual promise of spring to come. A peek at some embroidery to bring baby home. Do you know how badly I want to rinse that blue marker out so I can enjoy the sweetness of it? Patience is not my long suit. 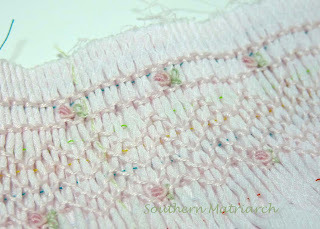 Tiny little rosebuds from one strand of floss and a tiny needle complete the smocked skirt. As soon as I get the sleeves and yoke embroidered it is onto construction. Stay tuned. And also stay tuned for a give away to celebrate 100+ followers. I feel like Sally Field, "You love me, you, really, really love me!" (Do you think she ever lived that down?) Give me a couple of days. 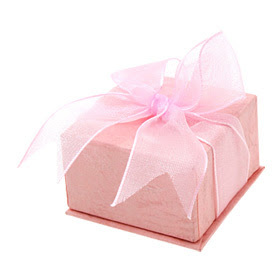 Since I am feeling "pink" I think it will be a pink giveaway. Be watching. Your embroidery is beautiful! The boullion roses are my favorites. I can't wait to see the finished dress. I am glad that you are passing along how you are just using one strand of floss for this tiny little creation. Everything in life needs to be in proportion and for a newborn the less dense threads look so much better. Your bullions are gorgeous, as always. I'm REALLY digg'in this fabric you are using!!! 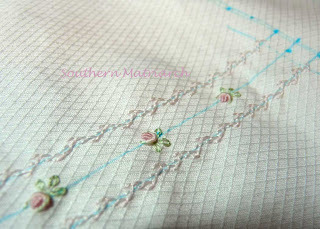 The embroidery & smocking are gorgeous - can't wait to see it completed! Thanks. I needed to hear this and see this! Beautiful again. Those bullions! Wow! I absolutely love your work. It's quite evident you love the art of hand sewing and embroidery. Oh that is pretty! I have visited your blog on a regular basis but never signed up to be a follower until today! Rats! I was hoping to be your 100th! But your embroidery is just to die for! Beautiful, beautiful!